It has been requested that the title of this article be changed to List of governors of Mississippi. Please see the relevant discussion on the discussion page. The page should not be moved unless the discussion is closed; summarizing the consensus achieved in support of the move. To be elected governor, a person must be at least 30 years old, and must have been a citizen of the United States for twenty years and a resident of Mississippi for at least five years at the time of inauguration. The Constitution of Mississippi, ratified in 1890, calls for a four-year term for the governor. He or she may be reelected once (prior to a 1987 amendment to the state Constitution, governors were limited to one term). The original Constitution of 1817 had only a two-year term for governor; this was expanded to four years in the 1868 Constitution. The lieutenant governor is elected at the same time as the governor and serves as president of the Mississippi Senate. When the office of governor becomes vacant for any reason, the lieutenant governor becomes governor for the remainder of the term. The governor of Mississippi is also, by virtue of his office, president of the board of trustees of the University of Mississippi. Since Mississippi became a U.S. state, it has had 64 governors, including 55 Democrats and 6 Republicans. Democrats dominated after retaking control of the state legislature; they passed a Constitution in 1890 that disfranchised most African Americans, excluding them from the political system for nearly 70 years, and made it a one-party state. The state's longest-serving governor was John M. Stone, who served two terms over ten years (his second term was extended to six years by a transitional provision in the 1890 Constitution). The shortest-serving governor was James Whitfield, who served ​1 1⁄2 months from 1851 to 1852. 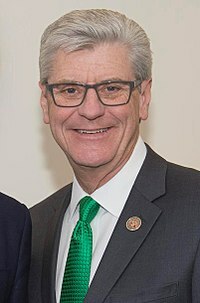 The current governor is Republican Phil Bryant, who took office January 10, 2012. His second term will end on January 14, 2020. As of January 2018[update], there are four living former Mississippi governors, the oldest Governor of Mississippi being William Winter (served 1980–1984, born 1923). The most recent Governor of Mississippi to die was William Allain (served 1984–1988, born 1928) on December 2, 2013. The most recently serving governor of Mississippi to die was Kirk Fordice, (served 1992–2000), on September 7, 2004. ^ David Holmes was inaugurated as the first state governor on October 7, 1817, but Mississippi did not officially become a state until December 10, 1817. ^ As lieutenant governor, filled term until next election. ^ Resigned due to illness. ^ The 1832 constitution abolished the office of lieutenant governor; the office was reinstated in 1868. ^ a b As president of the state senate, filled term until next election. ^ Resigned following an arrest for violating neutrality laws by assisting with the liberation of Cuba. He was found not guilty, but the political fallout led to his resignation. ^ As president of the senate, filled term until his senate term expired. ^ a b As president of the senate, filled unexpired term. ^ Resigned due to political tension over secession. ^ A constitutional amendment passed during McRae's second term moved the gubernatorial inauguration date from January to the prior November, shortening his term by two months. The date was restored to January in the 1868 constitution. ^ Charles Clark's term effective ended when he was arrested by Union forces. ^ a b Appointed by President Andrew Johnson following the end of the American Civil War. ^ Forced to resign and physically removed from office by federal forces after his government failed to comply with Reconstruction. ^ Left office as Reconstruction ended. ^ Resigned to take an elected seat in the United States Senate; Alcorn's senate term began March 4, 1871 but he delayed taking it, preferring to continue as governor. ^ Impeached; made a deal with the legislature to resign, and all charges were dropped. ^ As president of the senate, filled unexpired term, and was later elected in his own right; since both the governor and lieutenant governor had been impeached, with the governor resigning and lieutenant governor being removed from office, Stone was next in line for governor. ^ The 1890 electoral term was extended to six years under the 1890 constitution in order to facilitate changes in the executive department. ^ As lieutenant governor, filled unexpired term, and was later elected in his own right. ^ Changed parties in 2002. ^ Bryant's second term expires on January 14, 2020; he is term limited. "." National Governors Association. Retrieved September 5, 2009. ^ a b c MS Const. art. V, § 116. ^ MS Const. art. V, § 123. ^ MS Const. art. IV, § 72. ^ MS Const. art. V, § 121. ^ MS Const. art. V, § 124. ^ MS Const. art. V, § 117. ^ MS Const. (1817) art. IV, § 1; MS Const. (1832) art. V, § 1; MS Const. (1868) art. V, § 1. ^ MS Const. art. V, § 128–129. ^ MS Const. art. V, § 131. ^ a b "John Marshall Stone Archived 2010-10-09 at the Wayback Machine." Mississippi History Now. Mississippi Historical Society. Retrieved September 5, 2009. ^ "John J. McRae Archived 2010-10-09 at the Wayback Machine." Mississippi History Now. Mississippi Historical Society. Retrieved September 5, 2009. This page was last edited on 22 April 2019, at 18:26 (UTC).